Merry Christmas! Normally this time of year, we would be waking up to seam-stretched stockings, whip-cream smothered hot chocolate and everyone wearing their coziest slippers---all curled up on the couch. We would each slowly open our gifts, taking our time to stretch out our Christmas morning. We would be filled with Christmas music, bacon and eggs, big smiles and cheery surprises. Our living room would be a mess and ripped paper would be scattered like snowflakes across the carpet by the tree. But not this year. This year we are less adamant to wake up in our own beds, near our chimney-hung-with-stockings. This year we are leaving the abode early, embracing the length of the Christmas holidays as best we can. Which means: today we are not at home in Seattle, but at my Aunt's house in Idaho. But only briefly, until we jettison to our little cabin in the snow-piled woods in the northwest corner of Montana. Now a yearly tradition, we savor and dream about our wintery week in the woods for months ahead of time. So why not get a head start? We have many traditions for the week we hunker down in a little cabin: 1. sledding in disk sleds behind a snow-mobile, soaking up grandpa and grandma, snow-shoeing through the woods, and watching a movie series. Yes, each year it gets dark by 4pm. And since we have played hard building igloos and sledding all day, we return early to our darkened 'hut' to watch a movie each night. One year we watched Star Wars 1-6, another the Harry Potter series (sequentially: one movie each night). Another year: the Bourne series, and still another the Matrix. And in the midst of cuddling in, cabin fever, movie watching and all around vacation-relaxing: we traditionally drink mugs of Peppermint Schnaaps-laced hot chocolate. It doesn't get much better than that. We all have favorites, drinks associated with different times of year (to me: margaritas and mojitos belong in the summer!). Here is a list of 12 Christmas cocktails from me to you... not that I am advocating lots of drinking. Well... maybe I am. It is Christmas after all: a nice little holiday concoction is a good way to warm up, add some cheer and celebrate! 1. Christmas Kazi.I am proud of this drink: it made the home page for Food & Wine one year, a tribute to drink-concocting-bloggers. 2. Eggnog.This will kick you in the pants! Tread lightly. 3. Limoncello. So worth it... even for this 80-day recipe. 4. Pomcello. Right up there with Pomgria. I hosted an all-pomegranate party. I made pomegranate molasses and jelly, pomegranate jus for pom-seed filled pork. And fish cakes with pomegranate corn relish... And pomcello? I couldn't resist. I didn't have the requisite 80 days for TRUE infusion of the waiting-patiently variety. Instead I had less than a week: but nothing some vodka, simple syrup and fresh ginger couldn't handle. 5. Sidecar.This is my go-to drink. It isn't associated with just one time of year... and that's all I have to say about that. 6. Vin Santo. While living abroad in Italy, we became big fans of all the 'drinks.' Italians don't mess around when it comes to food OR drink. Grappa, Vin Santo: enjoy any time of day. Add some grappa to your espresso (okay---I tried this and almost fell over, pucker-face and all!). Add in Italian Spritz, Limoncello, Chianti and all sorts of red wines, and you are well on your way to appreciating Italian libations. 8. Mojito. I am picky about these. I don't normally order them out, because mine are good and difficult to match. Hehe. The secret is steeping the mint in simply syrup, adding lots of fresh squeezed lime juice and golden Cruzan Rum. And just a tiny splash of soda. Works every time. 9. Berried Brandied Sangria.This recipe goes with me wherever I go. It works with what juices and fruits you have on hand; all you need is a fruity red wine and a splash of brandy. So festive! So party! 10. Pomtini. Pomegranate-people are worth their marketing dollars. They are educating the populous, sending pomegranates to food bloggers, creating online community and pouring dollars into their online presence. There are a short list of companies I am impressed with, as they rally to take social-media attention... and branding to its new, next level. So: aren't you seeing pomegranate recipes everywhere? Pomegranate-infused desserts, entrees and cocktails? I joined the fun with this pomtini recipe. 11. Bahama Mamas. Yeah---you heard me right. We ordered these pool-side while on vacation a few years back. With all those good memories: of course we fell in love with them. I figured out how to make a version at home---for those times we all need to conjure up the sun. 12. Amaretto Limone.I made this drink a few years back. I still love the restrained combination of lemon, amaretto and agave. Maybe your new drink for 2011? 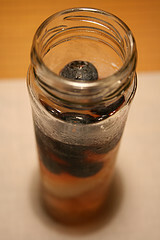 If for nothing else, than to smirk at the daftly placed blueberries in your glass.